Egan's book is a hard one to describe as there is no one singular storyline that runs the length of the book. Instead, each chapter is a different story told from the perspective of a different character. These characters cross over into each others' stories, allowing us to see how one person can be influential in so many other people's lives. For example the first character you meet is Sasha, but she crops up again as someone's best friend in college, someone's mother, someone's one night stand, and someone else's assistant. I loved the way the book was written and the whole idea lives being interlinked in such an intricate way. It's a hard one to describe but I really, really enjoyed it. Read this if you like... The lives of others, books that take place over several decades. I know, I know, you've heard the hype, you've seen the movie trailers. I've owned this book for about two years now and have only just picked it up to read it because I thought I should before seeing the film. 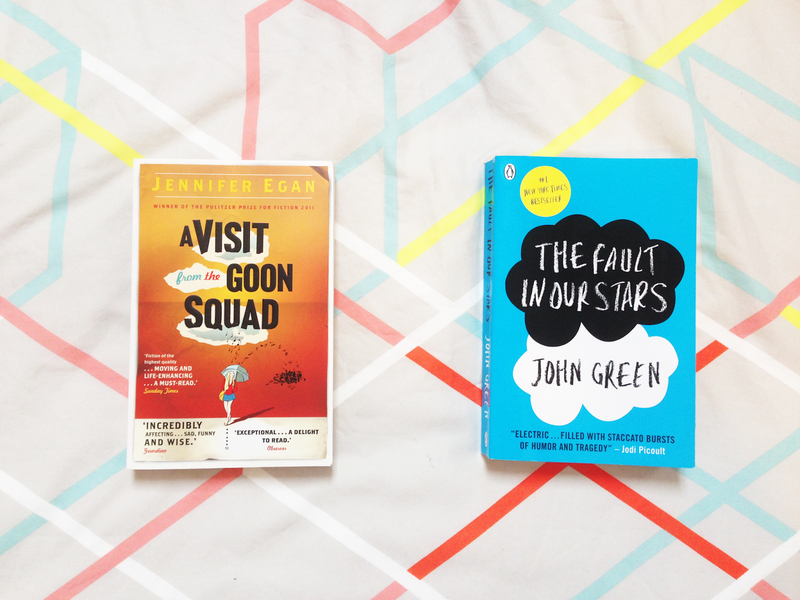 The Fault in Our Stars is a book about Hazel, a sixteen-year-old girl with cancer, who meets Augustus, a dreamy boy who has been without cancer for a great deal of months, at a support group. It tells the story of their relationship and their adventures together, but that's all I'm going to say without spoiling any of the story. It is a GOOD book, a really enjoyably good book, but only up until a point for me. I found it lost its pacing about two-thirds of the way in and by the end I'd lost interest to a certain extent. However, it was a really good read and I managed to get through it in just over 24 hours and three sittings. A lot of people's complaints have been that they didn't like the characters, and I have to agree, but I think it's only because I know what it was like to be that age and create a certain 'persona' around yourself, and that you grow out of it. It's, at points, like looking back into a mirror of yourself that you really don't want to be looking into. I like John Green, but this wouldn't be my top recommendation of his books. Go and pick up Looking for Alaska. Genre - Teen fiction, Young Adult fiction. Read this if you like... The Perks of Being a Wallflower, the tales of teens, easy reading. Looking for Summer Wedding Style?